Sarah Wilson, in her Sarah Wilson’s I Quit Sugar program, stresses the importance of activating nuts. This is something I’ve heard of, but have never done. I eat nuts very rarely, as I find them difficult to digest, so have been missing out on a great source of protein. I’ve tried many times to snack on almonds, but I always finish up feeling quite ill. When I read that activating nuts made them easier to digest, I knew this was something I must do. So last weekend, the almonds were activated by soaking them in water and placing them in an oven on the very lowest temperature for 12 hours. These nuts were just fantastic, quite soft, very tasty with much more flavour than usual. This weekend, I’m planning to activate pecans, walnuts and pepitas to make a nut mixture which will be a fantastic snack to take to work. 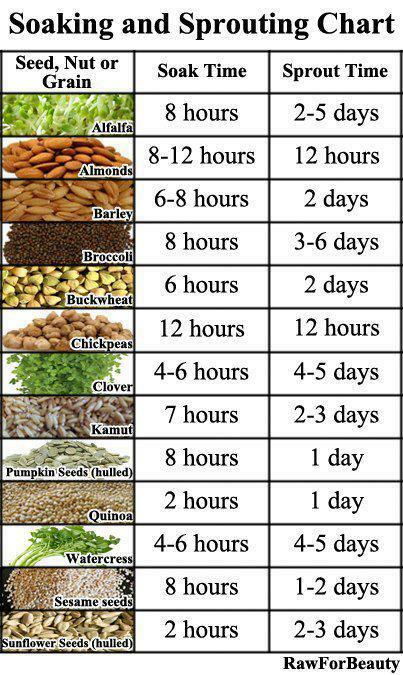 See the chart below for soaking and sprouting times for the various nuts.